Customers take Yelp, Facebook, and Google reviews very seriously – and so should you. Not only do reviews give you credibility, but they’re also helpful for getting feedback from customers. 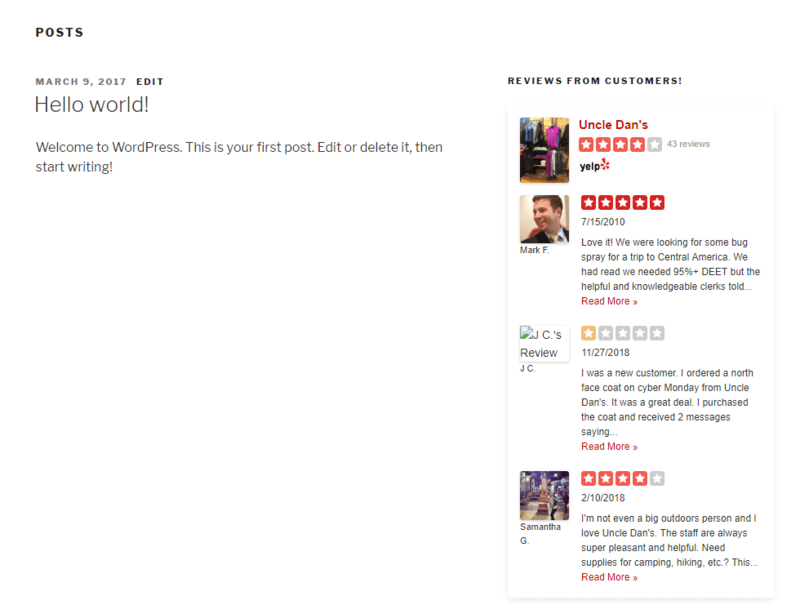 Better yet – if you’d like to add Yelp reviews to your website, all you need is a WordPress Yelp plugin! In this post, we’ll share 3 great Yelp review plugins. 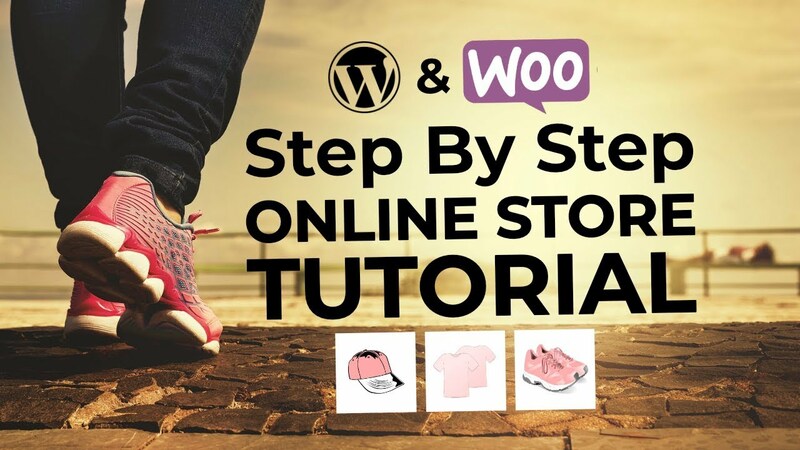 Then, we’ll show you step-by-step how to use a free WordPress Yelp plugin to add real Yelp reviews to your WordPress site. Surprisingly, there aren’t that many quality WordPress Yelp plugin options to choose from. However, there are a few that pull Yelp reviews and place them neatly on your website. This is the WordPress Yelp plugin we’ll use in the step-by-step tutorial below. It has a wonderful free version that extracts and displays three recent Yelp reviews on your site. It works through a widget so you can have your reviews shown in a sidebar or footer if you’d like. The developers also offer a premium version to show Yelp, Facebook, and Google reviews for $99 per year. 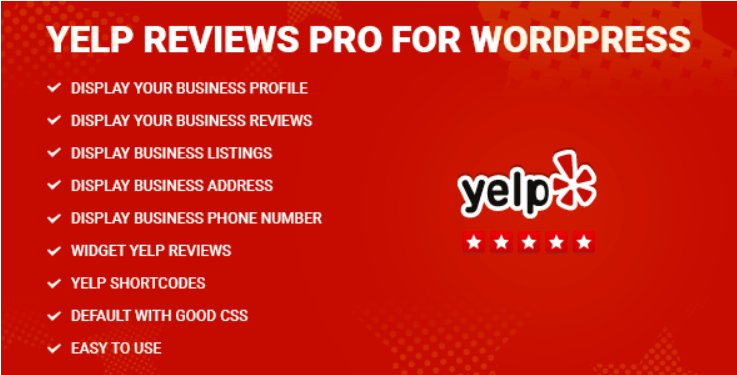 Yelp Reviews Pro is similar to the previous plugin since it has a free version. This allows for three Yelp reviews and some information about your business, all in widget form. The Pro Version is $45. The final respectable WordPress Yelp plugin is sold on CodeCanyon without any free version. It sells for $29 and provides a solid widget for reviews. You also receive some extra tools for featuring several business listings and guiding customers to your contact information. 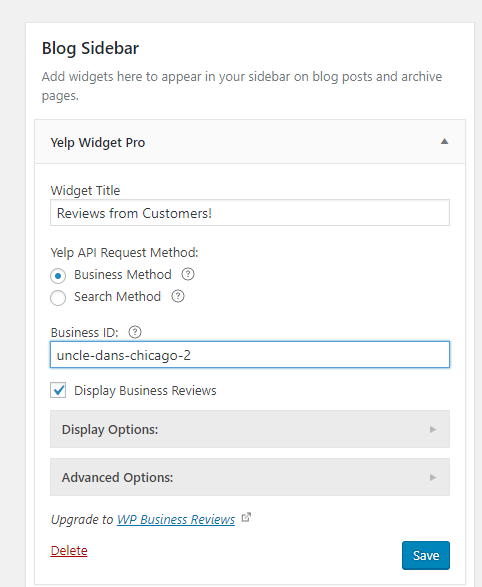 The first step is to install the free Yelp Widget Pro plugin from WordPress.org. Feel free to check out our guide on installing WordPress plugins if you need help with how to install a WordPress plugin. This reveals three steps you need to take in order to get your business Yelp reviews on your website. Click on the link that reads create your own Yelp app. This sends you to Yelp, where you’ll be required to log in to your Yelp account or create a new account. It doesn’t have to be your business account or even linked to your Yelp business account. A regular Yelp consumer user account works just fine. Type in your contact email. You can also type in a description for your own reference. 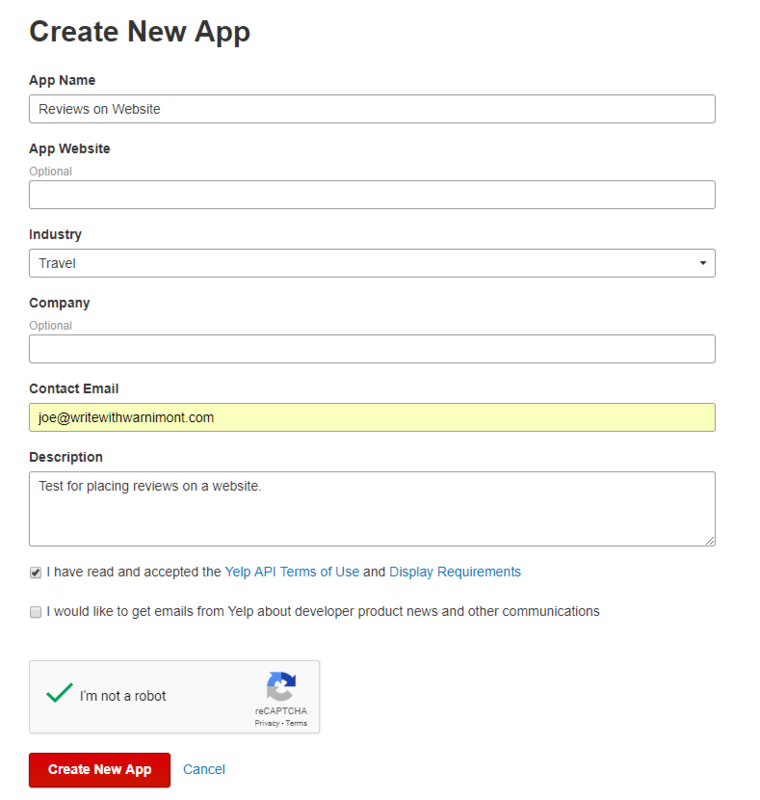 Yelp then reveals a Client ID and API Key for your app. The only item you need is the API key. Copy that value to your clipboard and go back to your WordPress dashboard. 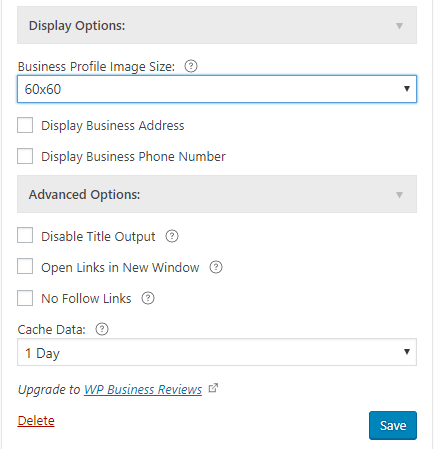 Make sure you’re still in the Yelp Widget Pro Settings area in your WordPress dashboard. 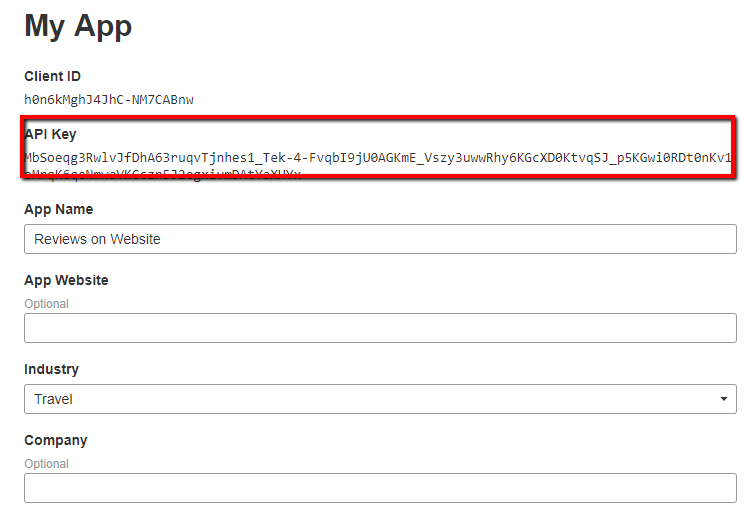 Towards the bottom of the page, you should find a field called Yelp API Key. Paste in the key you copied from the previous step. Don’t forget to click the Update button after you’ve added the API key. Scroll through the available widgets until you locate the one called Yelp Widget Pro. Drag this widget to the location of your choice. Widget locations depend on your WordPress theme, but for this tutorial, I’m placing it in the blog sidebar. Feel free to play around with the locations to see which one looks best. Next, open the widget settings and add a title for that widget. Leave the Business Method radio box selected. The most important part of this process is finding your Yelp Business ID. For this guide I’m simply choosing a business I like in Chicago, but you would want to find your own company’s page on Yelp. The business ID is everything after the /biz/ in your Yelp URL. Once you have it, paste it into the Business ID field. Below that, you can also adjust the display and advanced options, but most of them can be left as the defaults. The only elements that you might change include the profile image size, business address, phone number, and opening links in new windows. But all of these settings are completely up to you. Click on the Save button when done. Congratulations! You can now see Yelp reviews on your website. By default, the widget shows three recent customer reviews, along with a photo, your overall rating, and links for people to read more reviews. With the free plugin, it will display the most recent three reviews, no matter what a review’s rating is. However, if you upgrade to the Pro version, you’ll be able to add minimum filter ratings to only display positive reviews. From building trust with customers to directing customers to write reviews, utilizing a WordPress Yelp plugin can improve your online presence quite a bit. If you have any questions about how to add a WordPress Yelp plugin to your site, let us know in the comments below.